CHILDHOOD MEMORIES..THE GLORIOUS 50's and 60's! I grew up in the 50's and 60's......and was very lucky to have a wonderful childhood. Children then could BE children. I had magnificent adventures...right in my own backyard and parents who loved me dearly. My hometown was Binghamton, New York...and I lived there for twenty-three years. On this page, I'll be covering Binghamton's history. (Both of my parents also grew up there), and providing quite a bit of historical information. I think I have a good portion of the books ever written about Binghamton on my bookshelves!! I'll also be talking about life in the "Parlour City", as Binghamton was known...and my own life as a child.....growing up in a rural area. 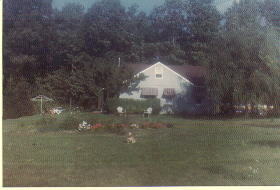 My Dad built our home in the country not long after I was born in 1947. He worked long, hard hours to complete it.....just enough so we could move in.... after coming home from World War II. I can't remember living anywhere but in this home...and my childhood and young adulthood years spent there were the happiest of my entire life. 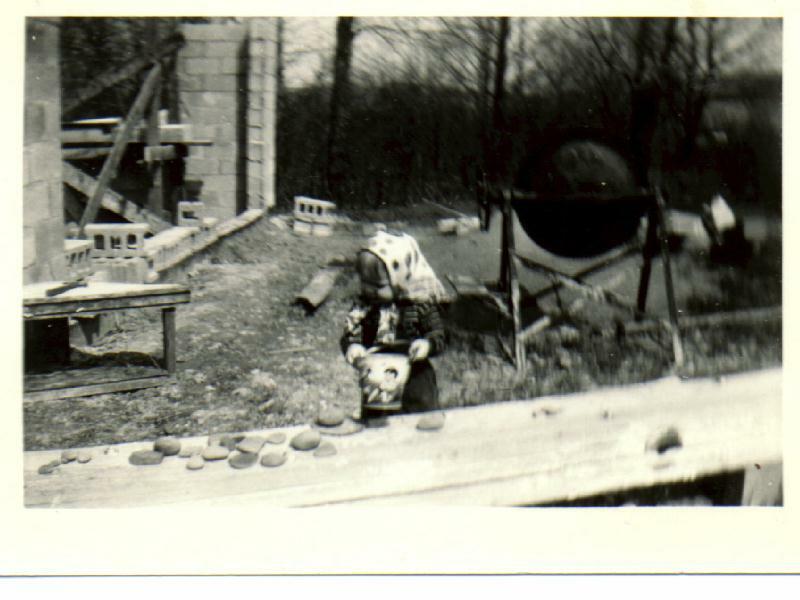 "Yours Truly" at age 2.....playing with rocks and a pail while my Dad was building our home. THE HOUSE MY DAD BUILT...taken about 1955. I WAS VERY LUCKY TO GROW UP IN SUCH A WONDERFUL ENVIRONMENT. IN THOSE DAYS, CHILDREN WERE FREE TO BE JUST THAT.......CHILDREN....WITH VERY LITTLE, OR NO TELEVISION...AND PLENTY OF TIME TO USE THEIR IMAGINATION, ROAM THE OUTDOOR WORLD, AND LIVE IN A MARVELOUS FANTASY WORLD WITHOUT CARES...JUST WONDERFUL DAYS...SPENT PURSUING HOBBIES, TAKING CARE OF PETS, CATCHING FIREFLIES TO PUT IN JARS AND USE AS "LANTERNS" IN THE BEDROOM AT NIGHT, EXPLORING THE FIELDS AND WOODS, AND LEARNING OF THE WAYS OF WILD ANIMALS...(IN MY CASE, I WAS PARTICULARLY FASCINATED WITH SNAKES! 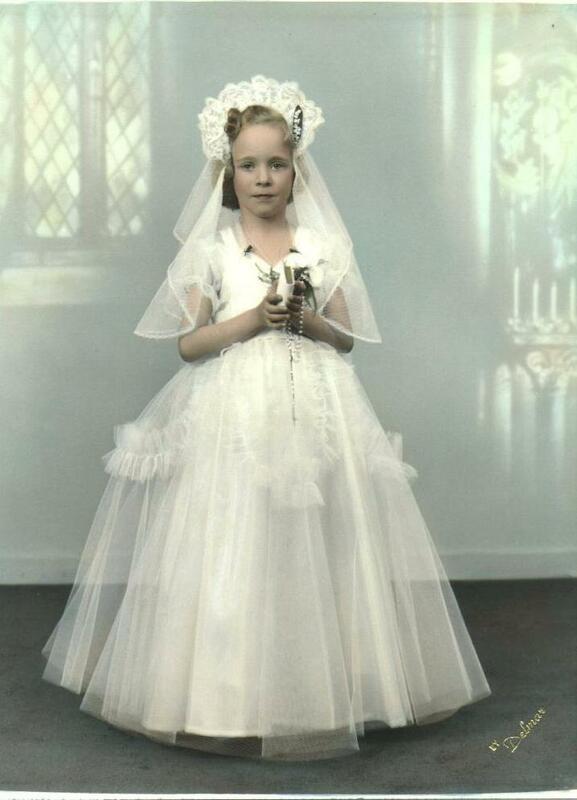 Um, the "snake" part may be hard to believe when you see this picture of me at my First Holy Communion!! Actually, at other times, I was quite the tomboy!! I've changed a bit since then, you see.......Here is a photo of "yours truly" taken in 1997. By the way, my nickname is "CAT"....and in chat circles, I'm known as "Katrinka", the One, the Only, Talking Cat on the Net!!! I chose the nickname Katrinka as it was the name of a cat in a book I owned as a child. She was no ordinary cat, you see....but a cat who TALKED and wore DRESSES......much as did my REAL childhood pet feline, "Twinkle" (or "my sister")..as I called her. You see, I've ALWAYS loved cats (and dogs, too!) from my earliest years, but I've felt a great affinity toward cats. Hmm....could I have BEEN a feline in another life?? Never say.....NEVER!! WHO TRULY MADE MY CHILDHOOD A PARADISE!! WOULD LIKE TO FEATURE ONE OF THE MANY POEMS SHE WROTE. CHILDHOOD ADVENTURES SURELY CAME FROM HER INFLUENCE ON ME. HOME IN THE COUNTRY, AND EVEN A POEM ABOUT OUR CHRISTMAS TREE !! I'D LIKE TO TAKE THIS SPACE TO INCLUDE ONE OF HER POEMS FOR YOUR ENJOYMENT. As you nod and you shake by night and by day. As you stand there so stately, so tall and green? That chatter and dance like a roomful of girls. You see them scamper inside when they are chased by a dog. How he hurries along and seldom is seen. How she sleeps in your shade after teasing a rat. And the unpleasant odor of a black and white skunk. Rests in your shade just dreamin' and wishin'. Quenching the thirst of the soil parched and dry. But you are contented with sun and dew. Just stand real erect in wind, snow, or rain. I'd also like to dedicate this page to my dog, Jan...who passed away many years ago. 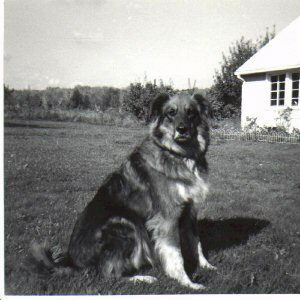 I had a very special dog in my early childhood...named "Tillie" who was like a sister to me. When I was 14, she passed on.....and Dad and I soon picked a new puppy which was to be mine to raise. We found her at our local humane society...and she turned into a marvelous dog...my best friend and confidante. In fact, she moved with me when I married...and lived to be about 13 in dog years. I have had many dogs since then, but Jan shall always live on in my memory. Her picture...the same one that you see here.....hangs on the wall of my parlor. I will also be covering Binghamton, New York history along with old photos as it is my hometown . So stay tuned! There will be more on Binghamton and its history.....including pictures of the horrible flood of the 30's, photos of Ross Park around 1911, plus pictures of the "Parlor City" in the late 1800's. Come back and visit often!! Please drop me a line and let me know what else you'd like featured on this page!